As we've said before, more people than ever have allergies these days. A 2011 study of over two million individuals conducted by Quest Diagnostics, the largest diagnostic testing company in the world, found that the frequency of allergies in the US increased by almost six percent within a four-year timeframe, and that frequency continues to rise.1 Six percent might not seem an alarming increase, but, in fact, sensitivity to two allergens in particular has been spiking at a lightning rate: mold allergies increased by 12 percent during the four years of the study, and ragweed allergies increased by 15 percent. Allergies develop when the immune system overreacts to contact with proteins in a particular food, drug, animal, or some environmental factor such as spores and pollen. (Note: a food allergy is an immune system reaction that occurs soon after eating a certain food. Even a tiny amount of the allergy-causing food can trigger signs and symptoms such as digestive problems, hives or swollen airways.) According to the Quest Diagnostic Report, "A healthy immune system produces proteins known as IgE antibodies that protect individuals from exposure to external substances that could cause illness, infection, and disease." In patients with allergies, however, the immune system makes specific-IgE antibodies that wrongly identify something, usually a protein, as a harmful allergen. This triggers the body to defend itself against the "invader" by releasing histamines and other inflammatory substances in the body to "counteract" that exposure, thus causing allergy symptoms. According to the study, one out of every five people now has a confirmed allergy, and those allergies lead to 17 million trips to the doctor annually as well as 30,000 emergency room admissions. But truth be told, it's likely that far more than the documented 20 percent of the population suffer from allergies of some sort. In fact, allergies affect more children than any other chronic medical condition. And speaking of food, although it's an integral part of life, for the people listed above it can be deadly. Sufferers of food allergies must avoid, for example, certain cereals, dairy, nuts, fish, or food additives at all costs, and scrutinize the list of ingredients of every food item to make sure that it's safe. The consequences of accidentally eating just a tiny morsel of the wrong food can be serious: breathing difficulties, swelling of the lips and throat, abdominal cramps and vomiting, and even death. While cow's milk and egg allergy are two of the most common food allergies in most countries, diverse patterns of food allergy can be observed in individual geographic regions determined by each country's feeding patterns. So, Why Are We Revisiting the Topic Today? Specifically, a nationwide, cross-sectional, random telephone survey for peanut and tree nut (TN) allergies headed up by Scott H. Sicherer, MD, Professor of Pediatrics at the Jaffe Food Allergy Institute at Mount Sinai School of Medicine, was conducted with a previously used questionnaire, with additional questions about sesame. A total of 5,300 households (13,534 subjects) were surveyed. Peanut allergy, TN allergy, or both was reported by 1.4% of subjects compared with 1.2% in 2002 and 1.4% in 1997. For adults, the prevalence was 1.3%, which was not significantly different from prior surveys. However, the prevalence of having either a peanut or TN allergy for children younger than 18 years was 2.1% VS 1.2% in 2002 and 0.6% in 1997. Note that the prevalence of peanut allergy in children in 2008 was 1.4% compared with 0.8% in 2002 and 0.4% in 1997. The prevalence of childhood TN allergy increased significantly across the survey waves (1.1% in 2008, 0.5% in 2002, and 0.2% in 1997). Or to put that in English, in the years from 1997 to 2008, peanut allergies tripled from 1-in-250 children to 1-in-70. And during the same time period, the incidence of tree nut allergies increased fivefold. Or to quote Dr. Sicherer, "It really is almost an epidemic." So, Exactly What Are Food Allergies? As mentioned earlier, food allergies are defined as adverse immune responses to food proteins that result in typical clinical symptoms involving the dermatologic, respiratory, gastrointestinal, cardiovascular, and/or neurologic systems. In more technical terms, if you have an allergy, your immune system overreacts to an allergen by producing antibodies called Immunoglobulin E (IgE).3 These antibodies travel to cells that release chemicals, causing an allergic reaction. IgE-mediated food-allergic disease results from activation of the immune system, causing a T helper 2 response which results in IgE binding to receptors on the short-lived activated immune cells (e.g. mast cells and basophils) that defend the body in an immune response. In less technical terms, the activation of these cells causes the rapid release of histamine and other mediators of an inflammatory response, with anaphylaxis being the most severe form of an IgE-mediated food allergy. Why Are Allergies on the Rise? Several theories exist as to why we're seeing a spike in food allergies. The experts suggest that one significant factor may be climate change. This is especially true for allergies to mold and ragweed, the two allergy categories which are increasing most rapidly. If you think about it, it makes sense. With longer growing seasons, ragweed pollen hangs around in the environment for more months, giving susceptible individuals more time to both develop sensitivity and to react. Also, hotter, wetter temperatures promote the growth of mold. As we've written before, scientists predict that pollen count will double by the year 2040, a horrifying prospect in terms of allergy outlook. Then there's the fact that so many new substances, chemicals, and drugs have been introduced into the environment and food supply. As we gain exposure to increasing amounts of combinations of these substances, we may develop new sensitivities, and sensitivity to one allergen sometimes triggers sensitivity to others. It's not unreasonable to think that the immune system becomes overloaded trying to counteract the effect of all the drug and pesticide residues in the environment and contaminants in our food. Other theories include the timing of when we are first introduced to different foods and how that food is prepared. And some scientists wonder if it's the result of using too many antibiotics. Is killing off the good bacteria in our gut causing problems? A lot of the microbiome hypotheses are coming into play right now to better understand why we're seeing this increase in allergies. And as we will see in a moment, this ties directly into the main theory proposed to explain the rise in allergen-based disease, including food allergies. And then there is the "hygiene hypothesis," which generally suggests that "clean living"--vs less farm living--and the use of medications to prevent and quickly treat infections leaves our immune system in a state that is both less able to respond to real pathogens and more prone to attack harmless proteins like those in foods, pollens, and animal dander. And when you think about it, this theory ties directly into the microbiome theory since the beneficial bacteria in your gut may be responsible for as much as 60-70% of your immune function. Nevertheless, a 2009 study published in the Proceedings of the Royal Society found that children who were exposed to more animal feces and had more cases of diarrhea before age 2 had less incidence of inflammation in their bodies as they grew into adulthood.7 As a result, the researchers surmised that the very development of anti-inflammatory regulatory networks in response to early microbial exposure ends up imbuing the developing anti-pathogenic defenses of the immune system with greater flexibility. And it is this process that explains the children's lower levels of inflammation producing C-reactive protein as they grew into adulthood. This is a big deal as inflammation, of course, in addition to being part of the allergic response, has been linked to many chronic adulthood illnesses, such as heart disease, cancer, diabetes, and Alzheimer's. And in 2015, Pediatrics published a study that found that in families who wash dishes by hand, allergic diseases in children are less common than in children from families who use automatic dishwashers.8 And more astonishingly, they found that children who grew up in homes that used automatic dishwashers had a 400-percent higher incidence of asthma than the children who grew up in homes where the dishes were washed by hand. Vive les germes! We certainly must do something. According to an analysis of private insurance claims by FAIR Health, an independent nonprofit that collects and analyzes data on privately billed health insurance claims, life-threatening allergic reactions to foods have increased 377% over the last decade.9 Perhaps a clue as to what steps we should take can be found in both a 2009 study presented at the American Academy of Allergy, Asthma and Immunology in Washington and a 2015 study published in the New England Journal of Medicine. The first study showed that when researchers gave tiny doses of peanut powder--the doses started at well under one thousandth of a peanut--to 33 children who had confirmed peanut allergies and then gradually increased that dose, most of the children developed a more balanced immune response to peanuts over time, with five of them dropping out after two-and-a-half years because they no longer displayed any signs of peanut allergy whatsoever. If you have an infant, you really do want to start introducing small amounts of potentially allergenic foods--especially peanuts--into their diets in their first year. Of course, if your child has already demonstrated a food allergy, then work closely with your child's physician when introducing these new foods. Now, if it's too late to prevent an allergy from developing and your child has already demonstrated problems with certain foods, then, under the supervision of an allergist, you again want to introduce very, very small amounts of the offending foods into their diets. Then very slowly, over many months--and again, under the supervision of an allergist--progressively increase the ingested amounts until your child can tolerate ever larger amounts of the offending food. Note: if dealing with micro-measuring is a problem, your allergist may be able to offer a patch, which allows small amounts of the food to enter through the skin, thus automatically desensitizing over time. Ultimately, whatever the trigger (food, pollen, you name it), allergies are an immune system issue. It's an improper response by the immune system that produces all the symptoms associated with allergies. In other words, any approach to dealing with allergies must address your immune system. You need to optimize it. Note: optimization is not the same thing as boosting, although boosting is part of it. An optimized immune system isn't just strong, it's also balanced. That means it can respond at full strength to real invaders, but not so strongly that it ignites a cytokine storm or so inappropriately that it treats foods as invading pathogens. 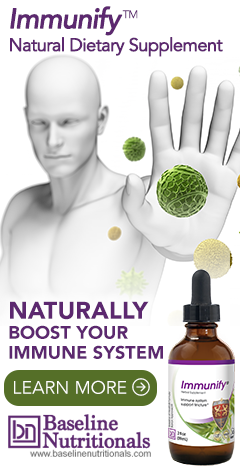 In other words, you must look at immunomodulators that can help tone down an overly aggressive immune system as well as immune boosting formulas. By the way, while we're talking about the immune system, let's talk about dirt--at least metaphorically. Current thinking says that a major factor in the surge in allergies we're seeing is the overprotection from dirt or germs or questionable foods like peanuts. A necessity for a properly functioning immune system is training that system to quickly recognize and respond to invaders--and to know the difference between an invader and food that you eat. Your immune system learns these things by experiencing these things. To paraphrase the Farmers Insurance ads, "Your immune system knows a thing or two because it's seen a thing or two." In the simplest possible terms: if you shield your child (and yourself, for that matter) from all exposure to germs, your child's immune system functions at a kindergarten level, not a graduate school level. And like a kindergartener, it will do foolish things--like attacking the food your child eats. In other words, don't be afraid of a little dirt. And absolutely stop using antibacterial soaps and wipes. They not only deny your immune system a proper education, but they also create super germs, and are toxic in and of themselves. Regular soap and water are more than enough for both you and your children. And finally, you need to optimize your gut bacteria. A properly functioning intestinal microbiome not only provides 60-70% of your immune function, it also directly kills invading pathogens and/or prevents them from taking root--thus obviating the need for your immune system to even respond in the first place. A good probiotic formula can play a major role here for everyone in your family. I have published multiple responses to articles and they never get published? And I never get answers? Does this mechanism work reliably? We got this one! Most comments are posted after they are reviewed. If you had asked for personal medical advice, we can not respond to those due to obvious legal reasons. Otherwise, we try to respond to most questions.